Come join one of the highly rated great adventures in the world of travel and tourism! This is a safari which will give you the opportunity to explore the most visited destinations in Kenya and Tanzania where you can enjoy the view of various eye-catching wonders of the world. Diani Travel Centre has combined all the attractions to provide you with a memorable experience. You don't have to worry yourself about where and when will you be able to spot the animal of your dreams. Your tour guide is well trained with all the information you need about both the destination, the host community, the flora, and the fauna found at every destination. Exhaust all your wants and needs beyond expectations! This safari is a vacation in itself. In every destination, Diani Travel Centre has chosen the best accommodation which will not only quench your accommodation needs and make you feel at home but also provide you with game viewing at the comfort of your room. You will be accommodated at Sopa hotel and lodges as well as Serena hotels and lodges chain within the destinations visited. Moreover, during the safari, please note that for things like brushing your teeth, Diani Travel Centre suggests you checking with your camp manager to find out if the tap water is safe to use. You will stay at Samburu Sopa Lodge for the first and second night, sleep at Aberdare National Park on the third night and Lake Nakuru National Park on the fourth night, then enjoy lodging at Mara Sopa Lodge on the fifth and sixth night. Serengeti Sopa Lodge will be your accommodation on the seventh and eight night followed by Ngorongoro Sopa Lodge on the ninth and tenth night. You will be camping at Lake Manyara Wildlife Camp on the eleventh night. Tarangire Sopa Lodge will be your accommodation on the twelveth and thirteenth night followed by Amboseli Serena Lodge on the fourteenth and fifteenth night. You will be picked up from Jomo Kenyatta International Airport (NBO) or your hotel in Nairobi and then be transferred to Samburu National Reserve. The reserve offers unique vistas of rounded, rugged hills and undulating plains. The mix of wood and grassland with riverine forest and swamp is home to a wide variety of animal and birdlife. Buffalo Springs records there are over 365 species of bird here. Game viewing and visibility is excellent with sights of reticulated giraffe, Gravy's zebra, elephant, oryx, Somali ostrich, hippo, crocodile, gerenuk, buffalo, lion, leopard, cheetah, and hyena. You will arrive in time for your hot lunch followed by an evening game drive. Dinner and overnight will be at Samburu Sopa Lodge. After breakfast, you will be driven north to reach Samburu National Reserve in time for lunch. An afternoon game drive will introduce you to this beautiful and game abundant park - home to rarely found species such as the beisa oryx, Grevy's zebra, blue-necked Somali ostrich, and reticulated giraffe. Dinner and overnight will be at Samburu Sopa Lodge. You will enjoy your early morning breakfast at Samburu National Reserve then depart after the breakfast for Aberdare National Park to arrive in time for your hot lunch at your hotel. Abounding with wildlife, unfettered by the more rigorous strictures of the Kenyan national parks, and designed to offer a charming blend of under canvas ambiance and uncompromising luxury, Aberdare has long been the preferred retreat of wilderness and safari lovers alike. It is one of the only four private game reserves in Kenya. You will depart after breakfast for Lake Nakuru National Park. The park is home to warthogs, waterbuck, buffaloes, reedbucks, and the occasional leopards. White and black rhinos were introduced to the park some years ago and you may find white rhino at the southern end. The park has also retained its reputation as an ornithologists' delight with more than 400 species of bird found here. You will arrive for your hot lunch and enjoy an afternoon game drive at Lake Nakuru National Park where you will also have dinner and stay overnight. After breakfast, you will be driven through the dramatic Great Rift Valley to the Maasai Mara National Reserve. This enormous reserve is actually part of the vast Serengeti plains. It is famously known for its spectacular great wildebeest’s migration and home of the Big Five: lion, elephant, leopard, buffalo, and rhino. You will have lunch at Mara Sopa Lodge before departing for the afternoon game drive. The Maasai Mara National Reserve is one of the greatest wilderness of the world. The large mammals are varied and easy to see. Residents among the parks include Masai giraffe, buffalo, eland, and thousands of the plain game including impala, zebra, topi, as well as both Thomson’s and Grant's gazelles. You will be waked up at 05:30 for coffee followed by an early morning game drive and back to the camp for a full breakfast. After breakfast, you will proceed for another game drive visiting the Mara River for hippos, crocodiles, and the migration point of the wildebeests. There’s also another option of proceeding for a game drive with a packed lunch till 18:30 in the evening. Dinner and overnight will be at Mara Sopa Lodge. You will be waked up at around 06:00 for a full breakfast and depart with a packed lunch to Serengeti National Park with a distance of 400 kilometers along Isbania border. You will arrive at the gate and begin a game drive with picnic lunch till evening followed by checking in at Serena Lodge at around 18:30. Serengeti National Park is one of the largest parks in Tanzania and is bordered to the north with Maasai Mara National Reserve in Kenya. The park is also one of the most visited, famous, and attractive. Serengeti National Park was voted as the seventh Wonder of the World because of the annual migration of the million wildebeests from Maasai Mara in Kenya to the Serengeti plains. Serengeti covers an area of 14,763 square kilometers. The physical attractions here include rivers, swamps, plains, kopjes rocks, grasslands, and woodlands savannah while the animals found here include the Big Five (lions, elephants, rhinos, leopards, and buffaloes), giraffes, wildebeests, zebras, cheetahs, hyenas, and Thomson's gazelles among others. Dinner and overnight will be at Serengeti Sopa Lodge. You will be waked up at 05:30 for a cup of tea or coffee and start an early morning game drive till 08:30 before the full breakfast. You will proceed for a game drive till around 13:00 for lunch afterward. Later you may relax till 16:00 then enjoy an evening game drive till 18:30. There’s another option of proceeding for a full game drive with a packed lunch till 18:30 as well. Dinner and overnight will be at Serengeti Sopa Lodge. You will be waked up at 06:00 for a full breakfast and depart to Ngorongoro, which distance is 130 kilometers, with a packed lunch. After arriving at Ngorongoro, you will descend to the crater floor for about 2,000 meters with an altitude of 1,980 feet straight up from the crater floor. Ngorongoro is one of the world’s heritage as it was voted as the eighth Wonder of the World. Physical attractions here are swamps, grasslands, woodlands, rivers, lakes, and hills among others while the animals found include elephants, lions, cheetahs, buffaloes, gnus, hyenas, and black rhinos among others. Ngorongoro supports such an amazing variety of animal life as if Noah’s Ark was foundered here. 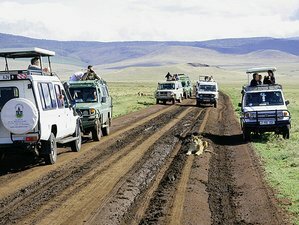 You will proceed with a game drive in the crater till evening with dinner and overnight at Ngorongoro Sopa Lodge. After breakfast, you will descend 600 meters into this magnificent crater for a full-day game drive. The Ngorongoro Crater is one of the most densely crowded African wildlife areas in the world and is home to an estimated 30,000 animals including some of Tanzania’s last remaining black rhino. Supported by a year-round water supply and fodder, the Ngorongoro Conservation Area supports a vast variety of animals which include herds of wildebeest, zebra, buffalo, eland, warthog, hippo, and giant African elephants. Another big drawcard to this picturesque conservation area is its huge population of predators which include lions, hyenas, jackals, cheetahs, and the ever-elusive leopard. You will enjoy a picnic lunch on the crater floor. You will also have dinner and overnight here. You will be waked up at 06:00 for a full breakfast and depart to Lake Manyara with a distance of 90 kilometers. After arriving at the gate, you will begin a game drive en-route to the lodge. You will check in at the camp at around 13:00 for lunch and relax till 16:00. Later, you will proceed for another game drive along the shores of Lake Manyara till 18:30 then back to Lake Manyara Wildlife Camp for dinner and overnight. Lake Manyara covers an area of 330 square kilometers of which 200 square kilometers is covered by the lake itself. Lake Manyara is also an alkaline lake where millions of flamingos live and different types of birds are also found here. "Manyara" is a Maasai word meaning euphorbia forests which lies along the Great Rift Valley. Manyara also provides a perfect introduction to Tanzania birdlife (over 400 different types of birds have been recorded including water birds such as pelicans, flamingos, cormorants, storks, fish eagles, and kingfishers among others). You will be waked up at 06:00 for a full breakfast and depart from Lake Manyara to Tarangire National Park with a distance of 110 kilometers. After arriving at the gate, you will begin a game drive en-route to Tarangire Sopa Lodge, arriving at 13:00 for lunch, and you can relax till 16:00 pm. You will proceed to an evening game drive till 18:30 then back the camp or lodge. Tarangire covers an area of 2,850 square kilometers. Physical attractions here include rivers, swamps, grassland savannah, and Acacia forests among others while the animals found include elephants, lions, giraffes, ostriches, fringed-eyed oryx, long-necked gerenuk, zebras, impala, buffaloes, wildebeests, hartebeests, and gazelles among others. Tarangire also hosts different kinds of birds including the kori bustard - the heaviest flying bird - and tree climbing python. Dinner and overnight will be at Tarangire Sopa Lodge. You will have morning and afternoon game drives in the park that offers wonderful panoramas of wide savannah grasslands dotted with open acacia woodland studded with large Baobab trees. Elephants can be seen here in herds of up to 600 at a time along with masses of wildebeest, zebra, eland, hartebeest, buffalo, and oryx which migrate from the dry Maasai steppe to the gleaming Tarangire River in search of water during the dry season. There are 550 species of birds that have been recorded here. Also, the park has tree climbing pythons. You will be waked up at 06:00 for a full breakfast and depart from Tarangire to Amboseli through Namanga border in Kenya with a distance of 380 kilometers. You will arrive at Amboseli Serena Lodge late in the afternoon for lunch at around 13:30. You may relax till 16:00 then proceeds to another game drive till 18:30. Dinner and overnight will be at Amboseli Serena Lodge. After early morning breakfast, you will explore the park through morning and afternoon game drives. You will have sufficient time for relaxation at the lodge complete with the majestic Mount Kilimanjaro in the background. Amboseli covers an area of 390 square kilometers with physical attractions like grassland savannah, swamps, and a view of Mount Kilimanjaro (the highest mountain in Africa of 5,895 meters). It’s also a home to elephants, giraffes, cheetah, zebras, gnus, hyenas, and buffaloes among others. Amboseli is also a paradise for birds. Dinner and overnight will be at Amboseli Serena Lodge. You will be early again today. The sunrise and emergence of the mountain peak from the clouds are dramatic. You will marvel at this scenario as you enjoy the breakfast. After breakfast, you will depart the park with an en-route game viewing drive to rejoin the Mombasa - Nairobi highway. You will be having your lunch in Voi town then proceed to Mombasa arriving in the evening. A highly proficient and customer oriented person, who's main objective is to ensure customer satisfaction and value for their money. With over ten years of experience Bruce is knowledgeable about every destination not only in Africa but also the in the World. Being a host and instructor, hes is reachable and available 24/7 and therefore highly reliable. In addition, he is conversant with immigration hence can assist in passport and visa processing. Despite of being a host,he is a leadership coach, life skills coach and a mentor. This safari will take place in various national parks and reserves of Kenya and Tanzania. The destinations in Kenya include Samburu National Reserve, Aberdare National Park, Lake Nakuru National Park, Maasai Mara National Reserve, and Amboseli National Park. Meanwhile, the destinations in Tanzania include Serengeti National Park, Ngorongoro Crater / Conservation Area, Lake Manyara, and Tarangire National Park. You will be served breakfasts, lunches, and dinners when you are outside Nairobi. Drinking water will be prepared for you during the safari as well. Regular food will be provided and in case of any special dietary needs, the food will be prepared upon request. Furthermore, Diani Travel Centre advises you to drink bottled water at all times in Kenya, especially if you have traveled from abroad. All Diani Travel Centre's recommended safari camps and lodges supply their guests with fresh and clean (filtered or bottled) water. Please book your flight to arrive at Jomo Kenyatta International Airport (NBO). Transfer from this airport is included. Diani Travel Centre will pick you up from the airport. Jomo Kenyatta International Airport (NBO) in Nairobi is the best terminal to get to this safari. However, you can also access it through Moi International Airport (MBA) in Mombasa.